Learn how to propagate roses from cuttings so that you can give your friends a free rose plant. You can root roses from soft wood cuttings in water, soil and potatoes. You may try to root roses from a bouquet. Roses are among the most admired flowers. But how do you get a start of a rose plant? Propagating roses from cuttings is easy, some will simply root in water, while others need special preparation for the cuttings. About 20 years ago I used to live at a place which used to receive daily heavy rains and the humidity around 100%. There I used to grow new rose plants by simply cutting the stems and put in ground. But such weather is not present everywhere so there must be some technique to create new rose clones from cuttings. 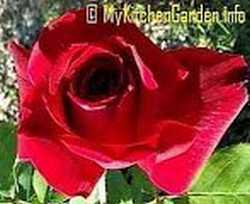 I have been rooting roses from cuttings since last 3-4 years and rooted more than 40 roses of different varieties with high success rate, and gifted to my friends and neighbors. The most successful planting medium that I have used for rooting rose cuttings is a mixture of potting mix and river sand in equal proportion to make it free-draining. New or Old Wood, Soft or Hardwood Cutting? Often you can be confused on the type of rose cuttings to take when you start your experiment on propagating roses. I have successfully rooted rose cuttings with both new and old wood. However, the success rate for the soft wood cuttings which have just bloomed and the petals have fallen, is very high, almost 100% if you try to root in spring and summer when the temperature is around 21 deg C. You could also take cuttings from new stems (soft wood) that have yet not bloomed. You can take cuttings from the old wood in late fall or even in winter. The success rate for old wood (hard wood) cuttings was not high for me. Also in winter, it took a very long time to root. When to Propagate Roses? When to take rose cuttings for propagation? Roses can be propagated from soft wood cuttings in spring and summer when the temperature is around 21 deg C. At this temperature some rose varieties will develop roots in as little as two weeks. Almost all varieties of roses can be rooted in three to four weeks at this time of the year. So you should take rose cuttings at this time of the year, preferably early in the morning. You can propagate roses from hard wood cuttings in winter. But the cuttings could take about 8 weeks or more to root. Following are the things you require to start propagating a rose bush. Small new pot or an old pot washed with soap water. Prepare a rooting pot before taking the rose cuttings. Fill the pot with the planting medium, thta is a mixture of [otting mix/garden soil and river sand in equal amount. Water the pot thoroughly and turn the soil in the pot to ensure the soil is saturated all over. Keep the pot aside for about an hour to let the excess water drain off. 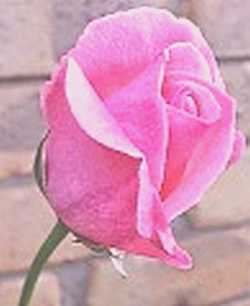 Choose a healthy rose plant in which the stem has just finished blooming. Cut the rose stem, about a pencil length, at 45-degree angle with pruning shears just beneath a leaf node. Remove the leaves from the bottom 4 inches of the cutting, leaving 2-3 leaves. Scrape the bottom 1 inch of the stem with a knife or a make 1/2 to 1 inch vertical slit to encourage more rooting. Dip the cut-end of the cutting to a depth of 1 inch into the rooting hormone powder. Roll the cutting to ensure an even layer of powder. Throw away the unused powder. if you do not have a hormone powder, you can use honey. Use a pencil size stick to poke a hole halfway inside the middle of the pot you prepared in step 1 and insert the end of the cutting into the hole, and firm the potting mix around it. DO NOT water again. Place the pot in a zip-lock bag or a polythene bag and tie it at the top or cover the pot with a 2-liter clean plastic bottle (Coke or any other drink) with its bottom removed, and place it in bright place but out of direct sun. This way the cutting will be in a "greenhouse" under high humid environment. 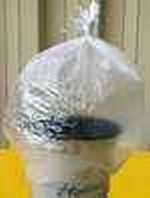 After a few days, you will notice water condensing on the inside of the bag. Each week, untie the pot and watch the progress. Add a little water if necessary. The top surface of the soil may be dry but it may be wet from inside. When the colour of the leaves begin to change to green, keep the bag slightly opened for one week to allow exposure to the outside environment. After one week remove the bag completely. Let the new plant sit in shade for another 2-3 weeks. Water regularly. Moving the new plant immediately into direct sun may kill the plant. Then place the pot in a position to allow morning sun for 3-4 weeks, by that time a few set of leaves will be formed. Is it possible to grow roses from cuttings without rooting hormone? Most rose varieties will root without the rooting hormone because rose cuttings contain auxin, a natural root promoting hormone. The auxin in rose plant is produced by the leaves and tips of shoots and accumulates at the bottom of the cutting, where the roots will form. However, there are some roses that do not produce adequate amount of auxin, so they are difficult to root without applying rooting hormone to stimulate the production of strong roots. You can root a rose cutting in a potato. Cut a potato in half and drill a pencil thick hole, half way through in it. insert the rose cutting in it. Plant the potato with the cutting in soil, 3-4 inch deep in a pot. Keep the soil moist, cover the cutting with a wide mouth inverted bottle to keep the humidity high. The potato will keep the moisture high. The rose cutting will root in 3-4 weeks. Some roses will produce roots in water, add a pinch of Epsom salt to water. Just put the cuttings in a water bottle and some of which may produce fine roots. Take out the cutting with roots and carefully plant in soil. Put the pot in indirect sun light and keep the soil damp at all the times. When the plant grows new leaves, then gradually allow them sun exposure. How To Know Whether the Cutting has rooted? There are three ways to tell whether a cutting is rooted. Tug lightly on the stem. If it resists being pulled out of the pot, it means it has roots. Cuttings that have grown many new leaves have roots. Inspect the bottoms of the pot for nay roots coming out of the drainage holes. Why the Cutting becomes dark? Too much water in the pot causes the cutting to rot, making it dark. This cutting will not root. I grew a Mr. Lincoln HT from a cutting last fall. It is growing like mad this spring/summer but I have no blooms? Be patient or something wrong?